I absolutely love doing styled shoots. 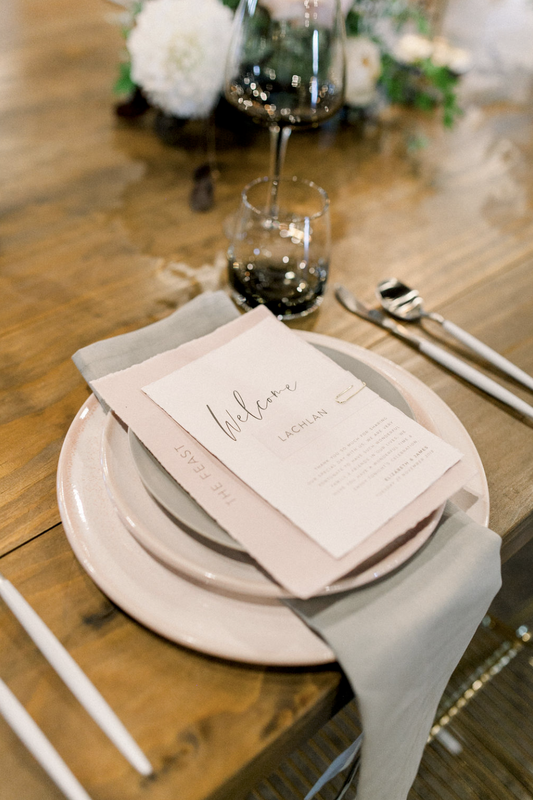 It’s not only a chance to work with some of the most amazing vendors in the wedding and events industry, but it really enables you to think outside the box and really test those ideas you’ve been wondering about. It’s fun to flex those creative muscles and in the end, it helps future couples imagine their big day. 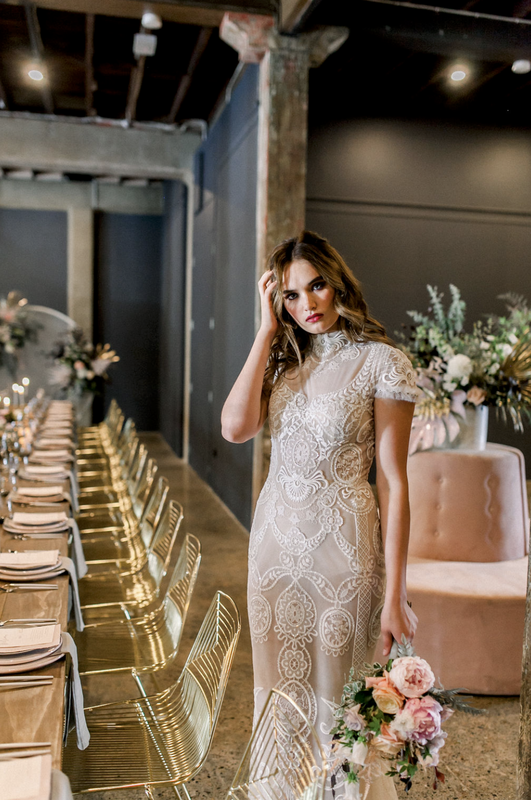 So let me introduce you to two of Brisbane’s newest event venues; the speakeasy style industrial warehouse ‘The Lushington’ in Woolloongabba and the revamped character filled ‘The Boundary’ in West End. First up is ‘The Lushington’ in Woolongabba. This stunning event hall has been restored to its 1925 glory, with art deco design and featuring a four metre high ceilings with original exposed beams. The beauty of this vast space is that it is really a blank canvas, so it’s perfect for brides and grooms with a strong vision, every aspect you can completely customise to your imagination. 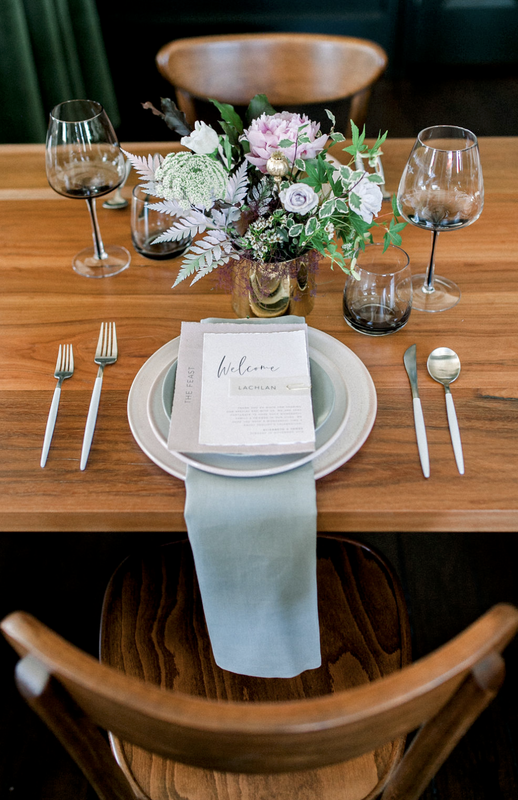 With stunning furniture from Hampton Event Hire; custom stationery by Laura Elisabeth Design; cutlery, crockery and napery from the Supper Club Co; glassware from Table For Louis; and lastly, florals us at Garden Graffiti, this romantic and glamourous table scape is just a small example of what all these vendors can put together. 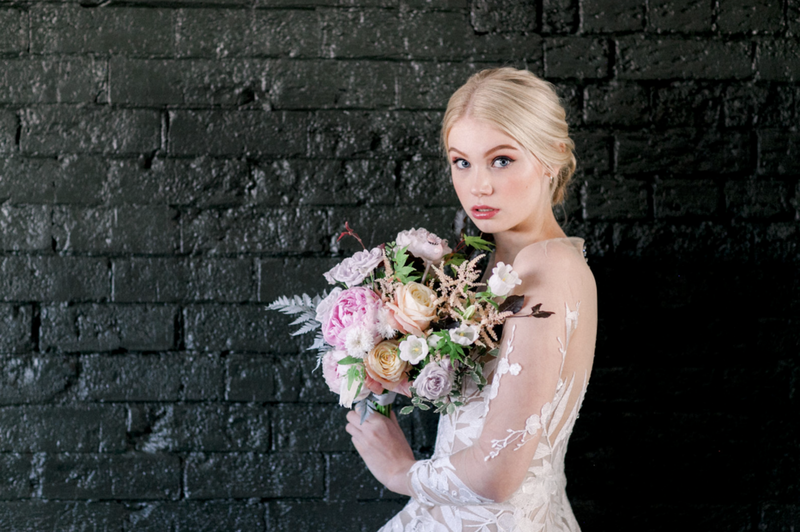 The Lushington also has this amazing stone wall at the back of the venue, and the natural light really makes our florals pop! 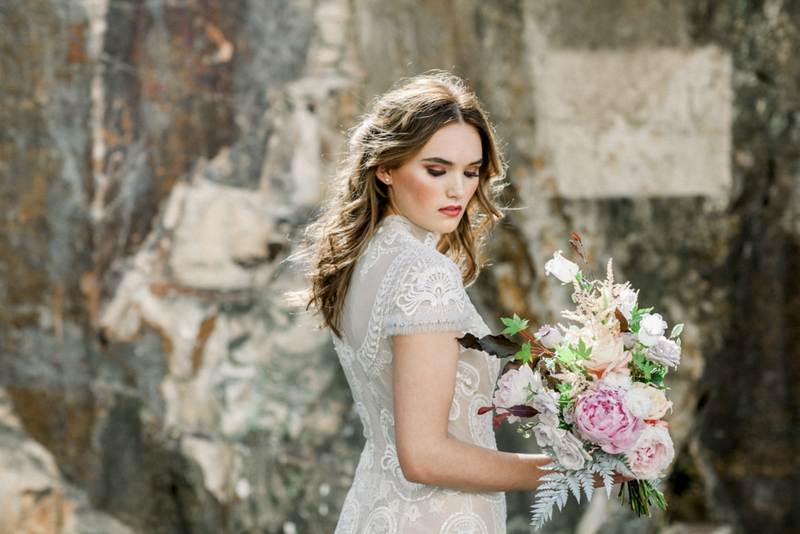 The very talented photographer Kate Robinson captured all the photos of this styled shoot and I definitely have to mention the stylists and directors who coordinated this all together in the first place, Alexia from The Other Bridesmaid and Danielle from White + White Weddings. Our beautiful model Chloe Maddison Ryan wears the gorgeous gowns designed by George Wu Couture; with hair by Kathy H Hair and make up by Dyan Copeman. 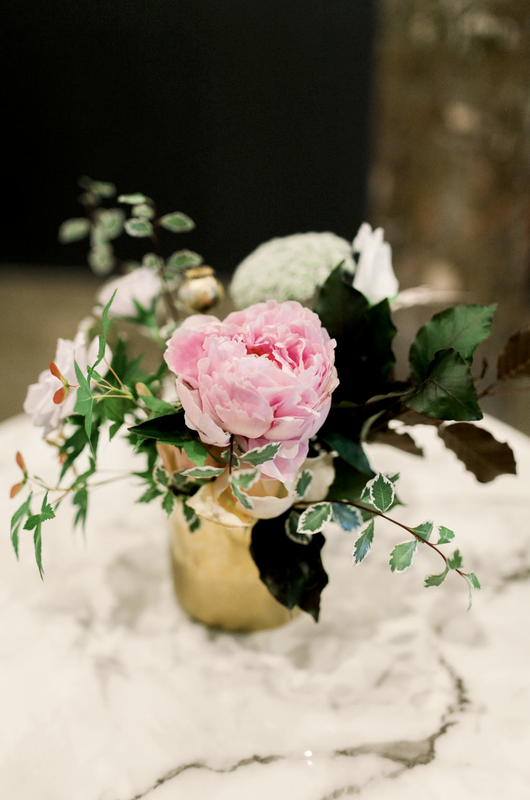 I used a mixture of fluffy, textured florals for movement, they included peonies, roses, queen annes lace, canterbury bells, astilbe, etc and I’ll talk more on the foliage below. Next up is The Boundary in West End! The Boundary Hotel has been a staple of West End for over 150 years. This historical building has undergone extensive renovations and has reopened as a multi-purpose venue, fully returned to its former glory. 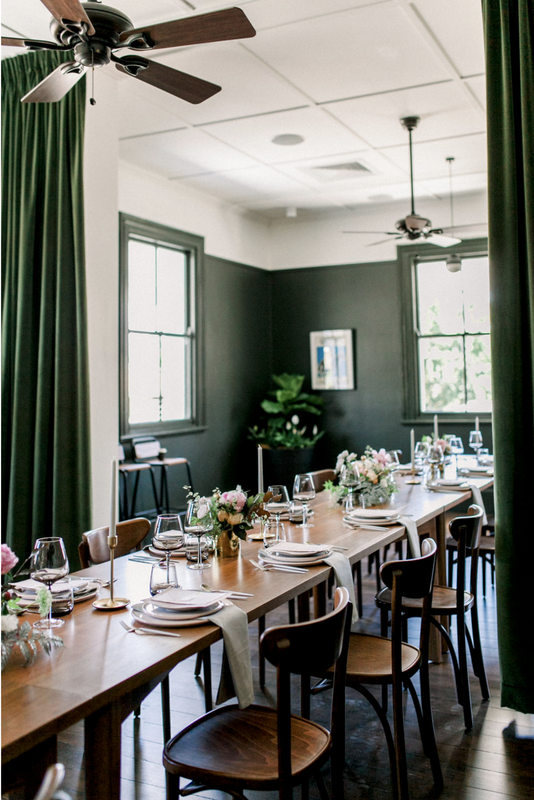 We used a very similar colour palette with this venue but it’s an entirely different look with the dark green walls, polished wooden floors and white skirting. I really love the old Queensland prints hanging on the walls and the lush colonial vibe. 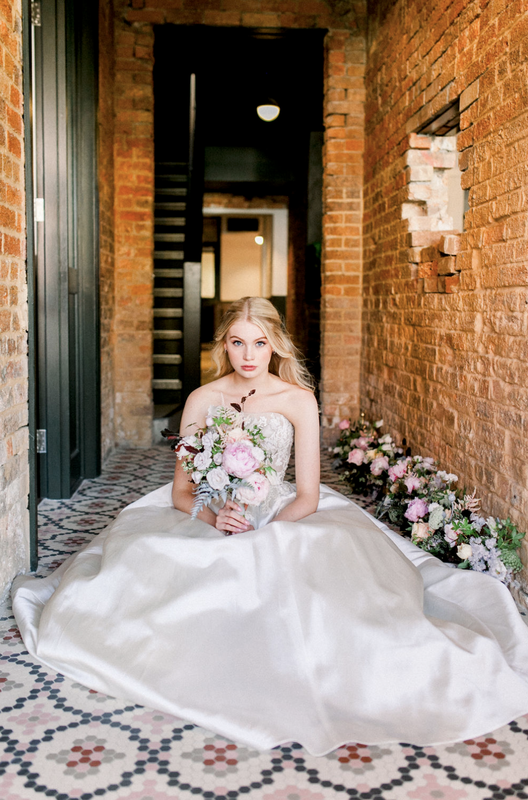 Our stunning model Ella in this elegant George Wu bridal gown. I used a mix of my favourite foliages; copper beech, variegated pittosporum, flowering smoke bush and silver eucalyptus. 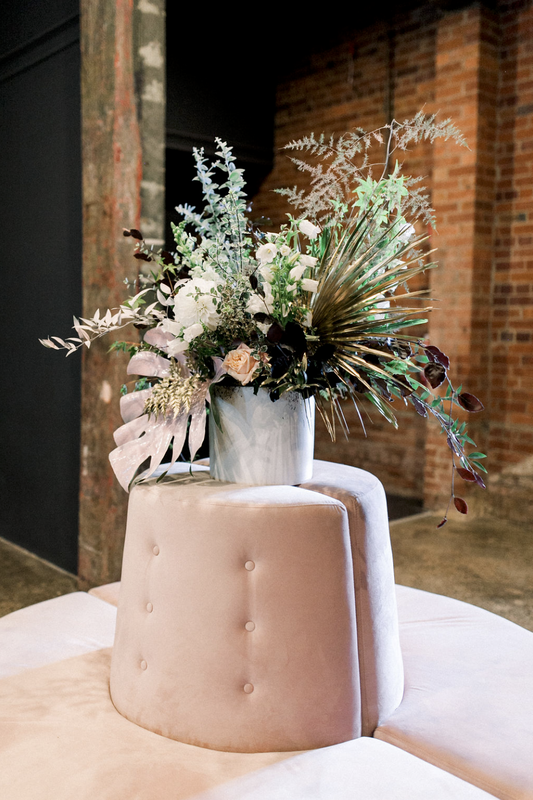 I also wanted to add a little bit of drama so I spray painted a few things in light grey, blush pink and metallic gold, like the leather and asparagus fern, poppy pods and tropical leaves, I really think these elements heighten the look and really tie in well to the colour scheme. There are so many different spaces within this venue to get really unique photos, and we are loving the neon sign below! We had the same vendors on board for both shoots and I hope you’ve found these images just as lovely as I have when I first opened them. There’s plenty of ideas out there, but the most important thing is sourcing the right vendors for you! 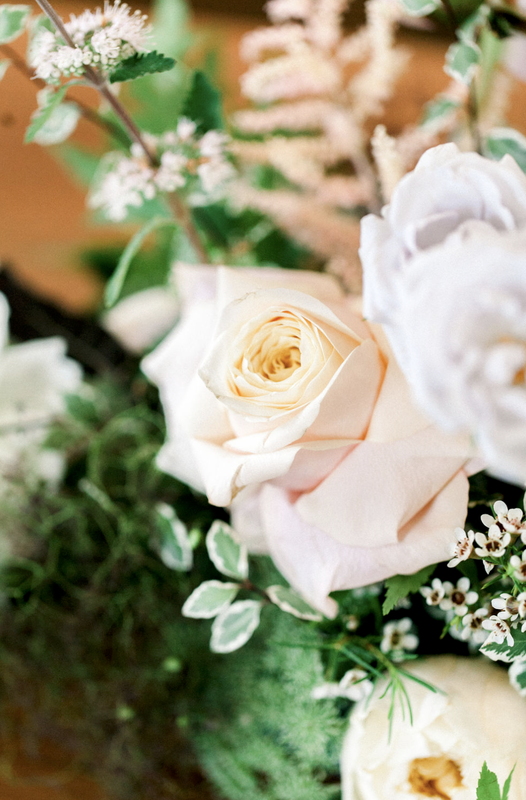 If you are looking for a florist in 2019 and 2020 for your wedding please get in contact with us here, we would love to chat with you and create something magical.